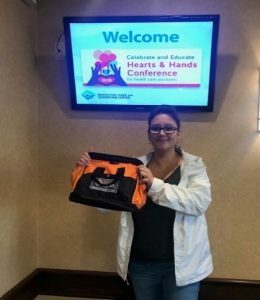 Road Safety At Work recently attended the Hearts and Hands conference in Penticton. Focussing on health care assistants, the conference theme was “Celebrate and Educate”, which coincided nicely with Health Care Assistant Day on October 18th. Health care assistants make tremendous differences in our lives and this annual event is recognized by unions, educators and employers all over our province. Health care assistants have many different job titles - community health worker, residential care aide, home support worker, long-term care aide, home health aide, continuing care assistant and personal care aide. One thing that all 35,000 BC health care assistants have in common is that they provide frontline personal care and service to people who cannot care for themselves. Another thing many health care assistants do is that they frequently drive as part of their work. With motor vehicle crashes being the leading cause of traumatic workplace deaths and injuries in BC, this is a high risk activity. Road Safety At Work is here to help health care assistants and their employers reduce workplace driving risks. We have joined forces with SafeCareBC to offer a free road safety workshop customized for the health care sector on November 28th. Please click this link to register. Congratulations to Delores Stubbington from Pine Acres Care Home in West Kelowna, who entered the draw at our booth and won a vehicle safety kit with one year of roadside assistance. Thank you to Delores and all of our health care assistants for everything you do, and be safe out there!